› Author AffiliationsThis work was supported by Université de Rennes 1, CNRS, Rennes Métropole, and Région Bretagne. A systematic study on the phosphorylation of BINOL and other bis-phenols with chlorophosphates is described. An intriguing reactivity has been observed that is attributable to the hydroxyl group acidity and to the leaving group nucleofuge character within the phosphorylating agent used. 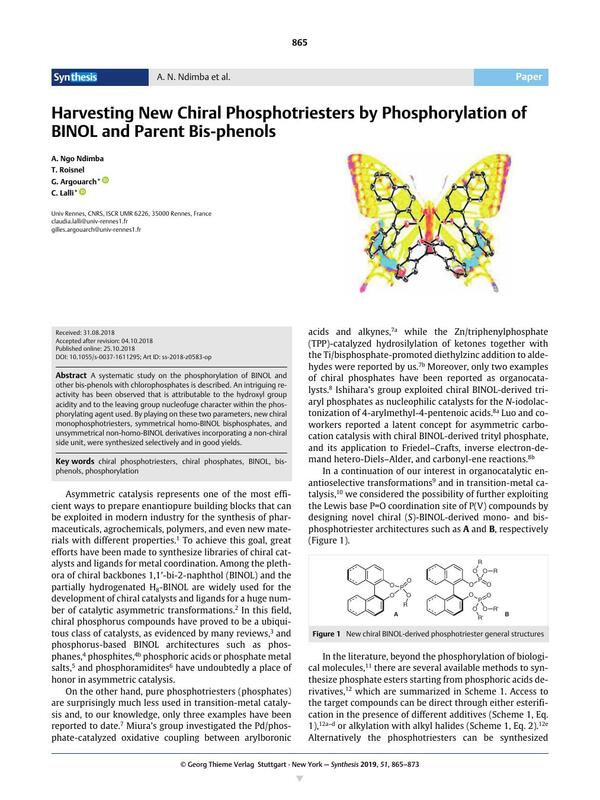 By playing on these two parameters, new chiral monophosphotriesters, symmetrical homo-BINOL bisphosphates, and unsymmetrical non-homo-BINOL derivatives incorporating a non-chiral side unit, were synthesized selectively and in good yields. Supporting information for this article is available online at https://doi.org/10.1055/s-0037-1611295. 17 CCDC deposition numbers are: 1582040 for 8, 1582041 for 9, 1582042 for 14, 1582043 for 18, 1582044 for 19, 1582045 for 26. These data can be obtained free of charge from The Cambridge Crystallographic Data Centre via www.ccdc.cam.ac.uk/data_request/cif.